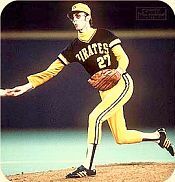 (a classic, by the way), and was reminded of the phenomenal pitching of a skinny submariner named Kent Tekulve. Back then, Tekulve was a freak and a pioneer — one of a handful of pitchers at the time who dug a niche as a short-relief specialist. His gangly frame and underhand delivery was effective against batters over the entire course of a 16-year career that ended in 1989 at the age of 42. Out of sheer curiosity, I checked out his stats and found some remarkable numbers. In that Championship year of 1979, Tekulve pitched in an unheard-of 94 games, saving 31, winning 10, and posting a 2.75 ERA in 134 innings! It was a near duplication of the previous season, when he tossed 135 innings over 91 games with a 2.33 ERA. In 1977 he pitched in “only” 72 games covering 103 innings. At the time, I distinctly remember “Teke” being profiled by Mel Allen on “This Week in Baseball”, and learning that his ability to pitch so often was due to his submarine style, which placed little stress on the arm. Tekulve continued to be the Bucs’ closer through the early 80s, before losing effectiveness in 1985. At that point he was sent to the Phillies, who used him in what we’d now call a setup role, and in 1986 he went 11-5 in 73 appearances and 110 IP. The following season — at age 40 — he appeared in another 90 games and 105 innings, posting a 3.05 ERA. At age 41 his ERA jumped to 3.60 while pitching in 70 games, 80 innings — not too shabby. This got me to wondering … if it’s true that a submarine delivery puts less stress on the arm, and allows a pitcher to pitch with more frequency and durability than overhand throwers, then maybe the Mets made a HUGE mistake in allowing Chad Bradford to walk. While we can’t ignore ChadBrad’s back issues, his rare style is ideal for the everyday, burn-em-out demands placed on middle relievers these days (especially those under W. Randolph and J. Torre). Naturally, I had to look further into this oddity and see how other submariners fared. The only other ones of consequence I could remember were Dan Quisenberry and Gene Garber. Quisenberry burst on the scene in 1980, helping to lead the Royals to the World Series in the closer role. He wasn’t like the one-inning closers of today, though — like Tekulve, he frequently pitched in multiple innings. In 1980 he appeared in 75 games, saving 33, winning 12, and amassing 128 IP. 1981 was a strike year so he pitched in only 40 games, but from 1982-1985 he AVERAGED 74 games and 134 innings per season. The 139 innings he logged in 1983 (when he posted a 1.94 ERA) rival the output of a typical 4th or 5th starter today — in fact he’d be in fifth place in innings pitched for the Mets in 2007 , right behind El Duque. Also like Tekulve, “Quiz” pitched well into his 30s. Garber, ironically, was in the Pirates organization with Tekulve, but they didn’t see a need for two submariners. Though he wasn’t the lights-out closer that Teke and Quiz were, Garber did enjoy a serviceable, 19-year career — finishing up at age 40. He regularly appeared in 60-70 games and topped 100 innings 7 times. What’s all this mean, and why am I wasting so much space on the topic of submariners? You have to buy into my first theory of relief pitching before you buy into submarine theory. Prior to 2006, when legitimate steroid testing of MLB players became mandatory, pitchers — particularly relievers — were remarkable when it came to recovery. Relievers had no problem pitching in 3-4 games per week, pitching back-to-back games, and maintaining a high level of effectiveness. Simultaneously, starting pitchers were throwing less and less innings — partially due to the MLB-wide insanity of adhering to the 100-pitch count and partially because the middle relievers were performing at a high level of competence. Let’s stop right here and admit something: that above paragraph is conjecture. I actually don’t know the stats will bear it out, but I’m working on statistical comparatives as we speak and will come up with some numbers next week. But I have a strong feeling we’re going to find that relief pitching performance, for whatever reason, has regressed considerably over the past two years. Perhaps it has nothing to do with the initiation of steroid testing. Maybe the “X factor” is that all starting pitchers are now groomed to pitch to a predefined limit. Maybe it’s a combination. But the bottom line is, every year, relief pitchers are pitching more innings, and being overused. If we are to buy into the theory that Kent Tekulve, Dan Quisenberry, Gene Garber, and other TRUE submariners (and Joe Smith does not fit into this group; he doesn’t get his hand low enough) put less stress on their arm, then we can also surmise that they are capable of throwing more innings, more often, and maintain effectiveness without breaking down as quickly as an overhand thrower. Of course, the theory could be flawed. Teke and Quiz may have simply been rubber-armed freaks. And it could have nothing to do with their underhanded delivery. But if you buy into the theory, then it would make sense to find a true submariner — preferably one who pitches effectively — to add to the bullpen. And not for a “different look” as Willie Randolph likes to say — but to be a nearly everyday workhorse out of the bullpen. Ideally, a guy who would be used in the 6th-8th innings of close games — and take some of the pressure off of your main setup reliever. I think we can all agree that Randolph’s abuse of Aaron Heilman (and others) the last two years has been detrimental to both Heilman’s and the team’s performance. Further, I don’t believe there are any post-steroid pitchers who can make 80+ appearances per season and remain consistent throughout. Your setup man — be it Heilman, Feliciano, Sanchez, or Mo Rivera (!) — should be treated like your closer, and only brought in when you have a lead. Operating on that plan, the setup man won’t pitch in 80 games — more likely, 55-65, which is more manageable. But you do need the rest of the ‘pen to eat up those other innings, and that’s why it would help immensely to have a submariner to “abuse” — a guy you can bring in every other day if need be. A guy like Kent Tekulve. Naturally, finding an underhander is about as easy as finding a knuckleballer. But chances are, the cost will be cheap. Former Met Chad Bradford is the first to come to mind. The Mets already have Steve Schmoll, but I haven’t seen him throw — can anyone confirm that he has a true underhand delivery? Mike Myers? Maybe Byung-Hyun Kim could reach a little lower. Or perhaps there is a diamond in the rough to import from Japan or Korea — the submarine style seems to be more accepted in the Far East. Ideas? Thoughts? Am I off my rocker? It seems like it would behoove the Mets to find at least one right handed submariner, even if he is only of the BY Kim variety. There’s no guarentee the guy would even make the team, but if he’s stocked away in triple-A, at least the option is available to us if the idea is re-explored. But don’t overpay for one (i.e. giving up Heilman for Bradford) and don’t overload the bullpen with only submariners. With guys like Tekulve and Quisenberry, you’re talking about all-star caliber relievers. I’m not entirely sure, but I’d assume their stuff was a bit better than the Bradfords and Schmolls in the game today. And whereas it’s certainly a possibility that the “today” submariners could appear in 80+ games, the productivity of those outings would be far less than their “older” counterparts…simply because they can’t get batters from the other side of the plate out. If you want to say their daily value to their team is still important, I’ll agree, because they can effectively get at least one or two big outs per close game. But I really don’t see a Chad Bradford throwing 100+ innings as Quisenberry and Tekulve did. He’s just not good enough to be asked to get that many outs. I agree you wouldn’t want a bullpen full of submariners. But I think finding one or two could be helpful in eating innings. Here’s the thing with Teke and Quiz: yes they were all-stars, but why? Was their ‘stuff’ really that good? Certainly they didn’t throw in the 90s, and likely not in the upper 80s. Neither threw a nasty breaking pitch — yes, they had some kind of a slurve thing, but it wasn’t an “out” pitch. My memory isn’t great, but I remember both throwing sinkers, at varied speeds, with pinpoint control. Lots of groundballs. So I guess what I’m saying is, maybe it’s time for the scouts to put the radar gun in the bag once in a while and take a look at some underhanded pitchers. Or perhaps look at the farm system and convert some guys. In other words, start building a larger pool of submariners, so that you can find a few guys that can be more than LOOGYs or ROOGYs. Because if pitching management continues at its current rate, EVERY team in MLB will have seasons like the Phillies this past year, using 20-25 pitchers in relief. I don’t buy into the idea that a righty submariner can only get out righties, and vice-versa; I think there simply isn’t enough of a talent pool to choose from, and the handful of guys who made it to the bigs never were taken seriously enough to face opposite-hand hitters (and therefore learn how to pitch to them). ChadBrad is one of only maybe a dozen true submariners in all of organized baseball (MLB + minors) — because no one gets signed unless the gun flashes 90+ MPH. Bottom line: MLB should look at submariners not because they “offer a different look” but because they have a pitching style suitable for the nearly everyday, 80-game grind that middle relievers now must fulfill.